Black and White stones, and a wooden board as their battle field. These simple instruments and just two player are all you need to play it, Baduk. There are several theories about its origin. One says that King Yo, the Sage has made it to amend character of his son who like fighting. Another claims that King Sun had contrived to train his son who was not so bright. The other insists it was made at the Age of the Warring States to teach arts of war. There are also other hypothesis; Baduk has been developed from a instrument for astronomy. Baduk has lasted over 2,500 years, it could be impossible to find the correct answer about its origin. However, it is sure what those suppositions means; Baduk indicates heaven, earth, and universe and its law and order. There are ten principles handed down from ancient times, that we should bear in mind to become a good player: don’t be so greedy to win; don’t rush toward th opponent’s territory in full vigor; be aware of your own weakness before making an attack; take the initiative; sacrifice the small for the big; drop useless stones resolutely in case of emergency; don’t act in haste; grasp the opponent’s situation and cope with it; keep the balance; and don’t be stubborn when isolated. These teachings are applicable not only to Baduk, but also for a wise and peaceful life. We are able to learn lessons through Baduk that will lead to harmonious and joyful lives with others. Someone may think it is too difficult and boring for its profundity and abstruse reason. How pity he is! You could find yourself amusing at Baduk more and more for its depth and true taste. Baduk gives us pleasure we couldn’t get easily from other games. For beginners, it’s hard to get some places or teachers for Baduk easily. Especially foreign amateurs have difficulty in getting useful help. Since Baduk is rooted in China, Korea and Japan, foreigners get insufficient informations evne their huge interest and demand about it. There are regular Baduk competition over the world already and many foreigners attend them. Their interest and need are getting bigger and bigger for Baduk, but its supply are not enough. Chihyung Nam a professional Baduk player in Korea and professor wrote the newly-published book ‘Baduk, Made Fun and Easy Vol.2′ (language: English) to help these Baduk these foreign beginners. This book is from her popular series of articles ‘Baduk, Made Fun and Easy’ published in the Koreatimes over two year. Nam gave you great lessons from the basic of Baduk including the terms and rules to practical steps by stages at Baduk, Made Fun and Easy Vol.1 published in 2006, and now she lead the way to the next level through this new book. You can get more profound lessons including Sente, Joseki, Ko, Sacrifice, Atari, and other technical skills in addition to conceptional teachings, so you could develop yourself by laying the foundation. Besides, you could also get some interesting informations: how to be a professional player in Korea; Baduk in North Korea; and some useful proverbs. Until now, foreigners used to get some information about it from Japan, so they feel Japanese word ‘Go’ more familiar than ‘Baduk’ the Korean. 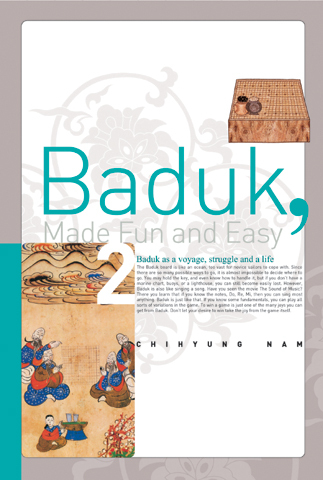 Nam is talking about ‘Baduk’ not ‘Go’ now, but you can enjoy this book without confusion. Baduk fans over the world are interested in Korean Baduk, but they get few information about Baduk. They concern Korean Baduk including its term and professional player in Korea more and more. You can get not only basic Baduk rules and techniques but also Korean Baduk culture and its pleasure. You will find yourself enjoying Baduk with this easy but detailed guide and helpful color pictures. 검은 돌과 흰 돌 그리고 그들의 전장인 나무판, 이 간단한 도구와 두 사람만 있으면 바로 시작할 수 있는 놀이, 바둑. 바둑의 기원에 대해서는 여러 가지 설이 있다. 중국 고대 성군으로 일컬어지는 요 임금이 싸움을 좋아하는 아들의 성정을 바로잡고자 바둑을 만들었다고도 하고, 또 다른 태평성대 시대의 왕 순이 어리석은 아들을 훈육하기 위해 고안했다고도 한다. 반면 혹자는 요, 순 같은 성군이 ‘파한지도구(破閑之道具)’를 가르쳤을 리 없으며, 바둑은 혼란하던 중국 전국시대에 만들어졌다고 주장하기도 한다. 이 외에도 고대 농업사회에서 중요시 여기던 천문학을 공부하던 도구에서 파생되었다는 의견 등이 전해진다. 2500년이 넘는 오랜 세월 전해내려 온 바둑의 정확한 기원을 찾는 것은 어려운 일이나 각각의 기원이 담은 뜻만은 확실하다. 바둑은 하늘과 땅, 우주의 이치와 질서를 내포하고 있음을 나타내는 것이다. 중국 원나라의 명수인 왕적식(王積薪)이 지었다고 알려진 위기십결(圍碁十訣)은 ‘바둑 둘 때 마음에 새기고 있어야 할 10가지 교훈’을 가르쳐준다. 이기려는 마음에 사로잡히지 말고, 상대에게 이르러서는 서두르지 않고 부드럽게 행동하며, 공격하기 전에 먼저 나 자신을 살피고, 돌을 버리고 선수를 차지하고, 작은 것을 버리고 큰 것을 차지하며, 위험한 상황에 이르면 물러설 줄 알고, 신중하며 경솔하지 말고, 움직일 때는 서로 상응이 되게 하며, 상대가 강할 때는 스스로를 보완하고, 위기에서는 한 발 물러나 살기 위한 길을 찾으라는 내용의 이 ‘바둑 10계명’은 단순히 바둑을 잘 하기 위한 기술적 법칙에 한정되지 않고, 오히려 바둑을 둘 때의 마음의 자세를 더욱 단속하고 있다. 이는 바둑은 물론 인생에 있어서도 하나같이 적용할 수 있는 교훈들이며, 우리가 세상을 살아 나가는 데 있어 필요한 지혜일 것이다. 그러나 이러한 오묘한 이치가 숨어 있는 바둑의 심오함을 인해 그것이 주는 재미와 즐거움을 경원시하는 것은 무척 애석한 일이다. 접하면 접할수록 깊이와 참맛을 얻을 수 있는 바둑은 다른 어떤 것에서도 쉽게 얻을 수 없는 즐거움이 담긴 유희라 할 것이다. 오늘날 바둑은 어느 스포츠 못지않게 세계적으로 사랑을 받고 있다. 10여 개의 국제대회를 통해 실력을 겨루고 있으며, 여류대회와 아마추어대회, 청소년바둑대회 같은 세계적 대회가 계속해서 열리고 있다. 이 같은 흐름에 맞추어 한국, 중국, 일본의 아시아 강대국뿐 아니라 세계 각지에서 바둑 애호가들이 끊임없이 증가하는 추세이다. 그러나 아직까지 외국인이 쉽게 접하고 도움을 받을 만한 바둑 안내서가 흔치 않아 여러 나라의 바둑 애호가들의 갈증을 풀어주기에는 턱없이 부족한 상황이다. 현 프로기사이자 명지대에서 바둑학을 가르치고 있는 남치형 교수가 펴낸 신간 (은행나무 刊/전문 영어)는 이러한 세계 각지의 바둑 애호가들을 위한 쉽고 재미있는 안내서이다. 저자는 한 영자신문에 “Baduk, Made Fun and Easy”라는 제목의 영문 바둑 강의를 연재하여 많은 외국인 바둑 초보자들에게 좋은 평을 받았다. 이 가운데 바둑 용어 설명과 경기 진행 방식 등 아주 기초적인 단계부터 시작하여 행마에 이르기까지 단계별로 쉽게 따라올 수 있도록 정리하여 2006년 을 출간했으며, 이번에 1권에 이어 2권을 출간함으로써 독자들로 하여금 초급 단계를 지나 한 계단 오를 수 있도록 안내한다. 독자는 1권을 통해 닦은 바둑의 기초 위에 선수, 정석, 패, 사활, 단수 등 보다 깊이 있는 기술적 가르침부터 ‘대마불사’에 이르는 개념적 가르침까지 중요한 가르침을 얻을 수 있다. 또한 바둑의 특징과 깊이 그리고 구성에 대해 자세하게 설명하고 있어 입문 단계에서 배웠던 바둑의 여러 가지 기본기를 보다 확실하게 익힐 수 있다. 더불어 실전 운영능력을 높이는 것 외에도 한국에서 프로기사가 되는 과정이라든가, 북한의 바둑 현황 등 재미있는 읽을거리도 함께 접할 수 있다. 지금까지 흥미와 필요에 비해 정보의 부족으로 어려움과 아쉬움을 겪었던 세계 각지의 바둑 애호가들은 이 책의 자세한 설명과 더욱 이해를 돕는 도판들을 통해 보다 쉽고 재미있게 바둑을 배울 수 있을 것이다. 또한 그간 일본의 ‘고(Go)” 위주의 바둑을 접해왔던 각국의 바둑 애호가들은 단순한 바둑 기술뿐 아니라 한국 바둑의 문화까지 더 자세히 느낄 수 있을 것이다.